Doug Weich pays tribute to Elvis in his new show Viva Las Vegas, which sees the Elvis Presley tribute artist mark his 7th consecutive year at the Rhumbelow with performances in Pietermaritzburg and Durban. 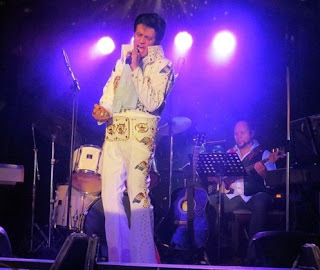 Back by popular demand, the show takes audiences on a journey of what it was like on the Vegas Strip when Elvis Presley was headlining at the International Hotel, when he made his return to live performances with his iconic gem-studded jumpsuits, starting from his debut in 1969 up until his last performance in 1977. The show also gives a glimpse of other iconic performers such as Cher, Tina Turner, Frank Sinatra, Dolly Parton, Elton John and Diana Ross who were entertaining in Vegas over the same period. Viva Las Vegas has one performance on July 22 at 14h00 in the Allan Wilson Shellhole, in Pietermaritzburg. (Venue opens 90 minutes before show for picnic dinner). Tickets R150 (R130 pensioners & block bookings of 8 or more). Bring food picnic baskets and a bar is available (no alcohol may be brought on to the premises). There is limited secure parking. Durban performances take place at the renovated Rhumbelow Theatre in Umbilo from August 3 to 5 and again from August 10 to 12, 2018.